Product prices and availability are accurate as of 2019-03-25 01:08:04 EDT and are subject to change. Any price and availability information displayed on http://www.amazon.com/ at the time of purchase will apply to the purchase of this product. 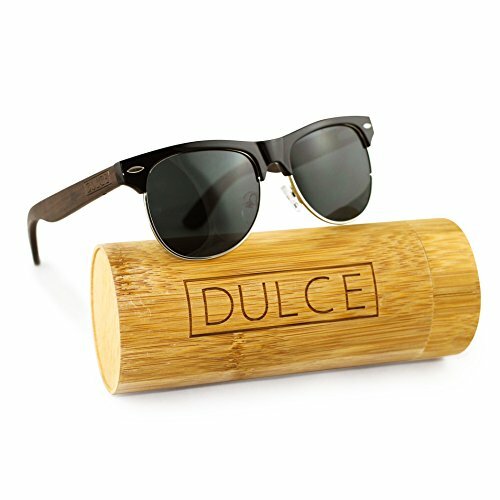 Apart from our name translating to 'Sweet' Dulce provides premium quality wooden sunglasses with real unique wooden designs. Each of our sunglasses are handmade, solid, and assembled with the highest quality standards. Our number one priority is customer satisfaction, we take pride in providing customers with premium quality goods and unparalleled customer service. Our lenses are created from premium thermal-cured plastic much lighter and stronger than conventional glass. Our frames are timeless, unisex and coupled with unique wooden temples these shades are extremely popular, combining well with a summer beach or winter layered look, giving you a sophisticated style that will turn heads! The wooden temples fold perfectly, each pair are checked to ensure perfect fit. You'll never have a wonky pair with Dulce. smoothed corners and contours for comfortable fit. Highest quality double springed hinges ensures perfect fit to any size head. 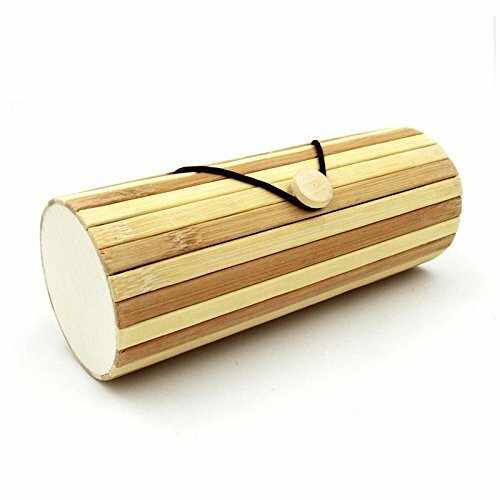 A cool natural bamboo cylinder box to protect your sunglasses that can double up as a pen container at home or work. The polarized shades are perfect for hiking, fishing, boating or at the beach. Your new Dulce UV protected polarized sunglasses with a timeless lightweight, comfortable design are ideal for any use. 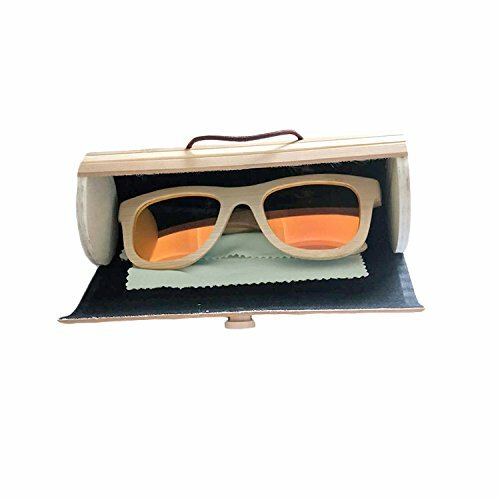 HANDMADE WOODEN BLACK WAYFERER STYLE - Durable 100% exotic rose wood designer sunglasses that perfectly fit any face. Look good and feel great in these stylish sunglasses for men or women. This is an ideal birthday or christmas present! ROSE WOOD ARMS - Lightweight frames are 50% lighter than Ray-Bans and are handcrafted to high quality design standards. These Glasses come with dual spring hinges that allow the arms to be bent backwards and not feel tight even on larger heads. Feel the difference, youll have all your friends asking you where you got them. 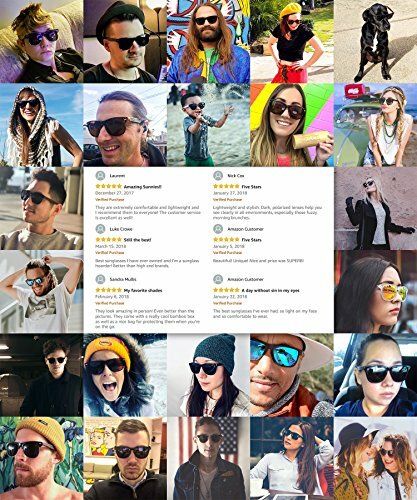 POLARIZED LENS - Blocks Harmful Rays With 100% UVA/UVB protection these premium UV400 lenses work great to protect your eyes while driving, on your boat in the water, skiing or boarding onsnow, or chilling at the beach. STYLE DEFINING SHADES - These sunglasses work for any style or look, wether you are a surfer, skater, boarder, casual, preppy, bohemian, girly, punk, artsy, 50's, 60's, sporty, or whatever style, these babies will keep you looking fresh whilst also protecting your eyes. 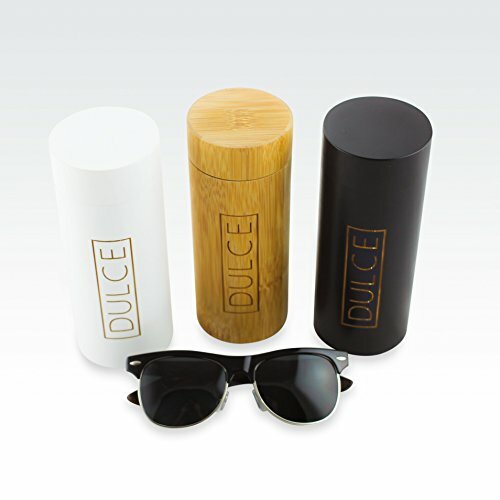 FREE BAMBOO CASE, CLOTH POUCH & MICROFIBRE CLOTH - Every Pair of Dulce Shades include a Bamboo tracel case that can double up as a pencil holder, a microfibre cloth pouch to protect your glasses from scratches a Microfibre Cleaning Cloth that works as a lens or glass cleaner to ensure your shades are clean and protected!